Nineties teens find themselves trapped in the perfectly anodyne world of Fifties monochrome soapland in Gary Ross’s technically brilliant satire. Sadly, there is no ‘Pleasantville’. The picture perfect town was built from scratch in Malibu Creek State Park, Las Virgenes Road off Mulholland Highway, south from Route 101, in Calabasas northwest of Los Angeles. 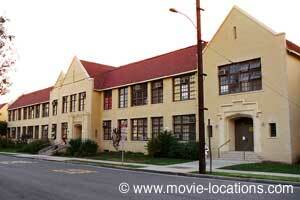 School interiors were filmed at Rose City High School, 325 South Oak Knoll Avenue in Pasadena, which was also seen in Stuart Little 2, Steven Spielberg’s Catch Me If You Can and supplied ‘Harvard’ interiors for Legally Blonde; also at Valencia High School, Valencia; and at John Burroughs Junior High, 600 South McCadden Place, Hancock Park, a veteran location seen in Pretty In Pink, Never Been Kissed, What Dreams May Come and Teaching Mrs Tingle.